A former advertising planner in Beijing TV, currently a full time mom of three boys in Irvine California, Miaolian’s journey in Chan started in a random Saturday afternoon in 2008 in a community park. She was taking her sons out for some afternoon outdoor activities and ran into a Chan class offered at the community center in the park. In 2011 she went to Taiwan to participate in the founding of Shakyamuni Buddhist foundation. 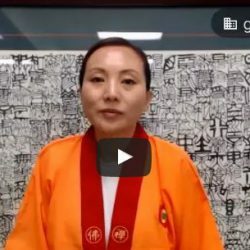 Right before the ceremony, the moment she put on the dharma robe for the first time, her heart was deeply touched by a warmness that she never felt before and tears came out uncontrollably. While meeting the 85th Chan Patriarch Wujue Miaotian later the same day, she asked to take refuge with the master and her wish was granted right away. In 2012, she was in Taiwan to share her Chan experience in a dharma assembly of 20000+ people and was ordained right before the assembly. 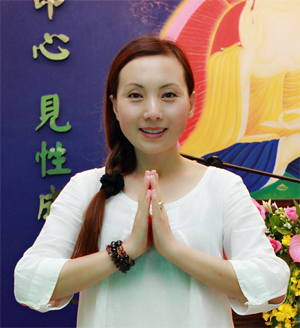 Currently she resides in Irvine, California and shares Chan teachings at Irvine Center.